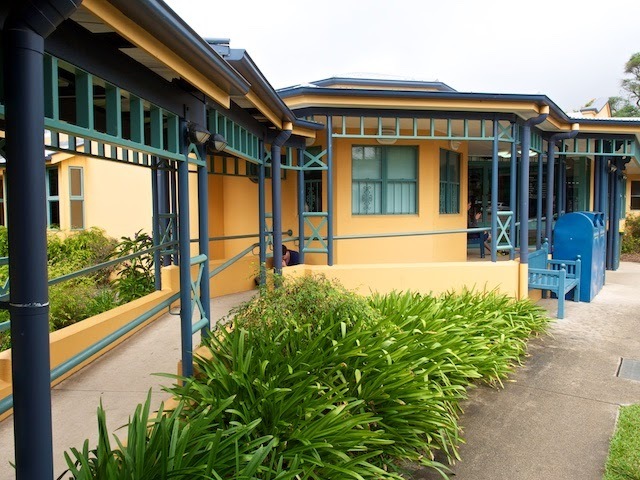 The last time I posted a photograph of the library at Maleny, I may have inadvertently caused some angst by some offhanded comment about it's pretence at being something that it's not. So rather than cause further offence by noting that I am still firmly of the belief that painting a building in a bright colour and decorating it with steel trellis does not magically transform it into a thing of well proportioned beauty. But it is loved and used and what better outcome can there be than that for a public building? The colour reminds me a bit of a house here, though the shade is a bit darker. I've found that house's garish colour to be offset by the painting they did on the trim last summer.